A TASTE OF THINGS TO COME AT VUE GRILLE & BAR • DIREC TOR OF AGRONOMY RECEIVES TOP TOURISM AWARD! 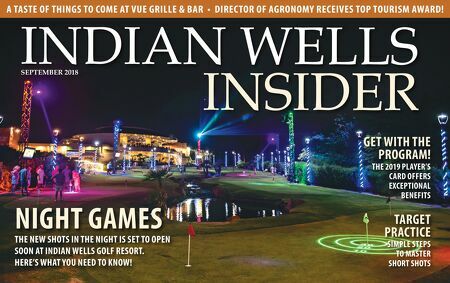 INDIAN WELLS INSIDER SEPTEMBER 2018 GET WITH THE PROGRAM! THE 2019 PLAYER'S CARD OFFERS EXCEPTIONAL BENEFITS TARGET PRACTICE SIMPLE STEPS TO MASTER SHORT SHOTS NIGHT GAMES THE NEW SHOTS IN THE NIGHT IS SET TO OPEN SOON AT INDIAN WELLS GOLF RESORT. HERE'S WHAT YOU NEED TO KNOW!